SlimDril is an authorized dealer for several major Rock Bit manufacturers and maintains an in-house inventory of the most common sizes and types of Mill-Tooth and TCI Rock Bits. Inventory includes bits specifically designed for jetting or motor applications. SlimDril maintains an inventory of several fixed cutter designs of Wing Type drag bits for jetting and motor applications. 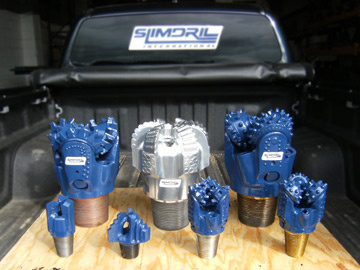 SlimDril manufactures several roller (mill tooth and TCI) and fixed cutter (carbide and PDC) washover bits, acceptable for drill pipe or casing applications. See the menu on the left for drill bit types to suit your project.